More details about RI-MAN, the soft-skinned robot, were revealed in a press release issued by RIKEN yesterday. 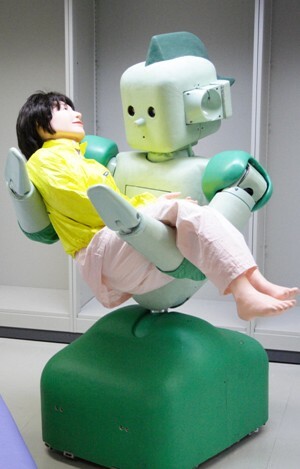 RI-MAN is the world's first robot designed for lifting and carrying humans. A variety of sensors, including flexible tactile sensor sheets, provide RI-MAN with a sense of vision, hearing, touch, and smell. These senses help RI-MAN perform tasks such as locating people who are calling out to it, responding to spoken commands, carefully lifting those who need lifting, and checking the sanitary condition of the person it is carrying. RI-MAN is able to integrate a wide range of sensory data to adapt to changes in the environment. The robot is also equipped with 19 motors, controlled by a system of hierarchical distributed processing that is modeled after the nervous system found in biological organisms. This "nervous system" -- a network of what RIKEN calls C-CHIPs -- integrates sensor data processing with motor control to provide RI-MAN the autonomy needed to respond quickly to changes in the environment. The head has 3 degrees of freedom, each arm has 6, the waist has 2, and the base (which acts as RI-MAN�s legs) has 2. Safety-related technology, including safety circuits and soft skin and joints designed to prevent injury, are incorporated into RI-MAN�s design. Still in the initial testing phase, RI-MAN is currently practicing with dolls that weigh about 12 kg (26 lbs). Researchers plan to increase the weight of the practice dolls over time, with the aim of achieving the ability to lift human adults in 5 years. Researchers will continue working to upgrade RI-MAN's sensors and data processing skills to improve adaptability. The aim is to create a robot with the physical power needed for heavy lifting and the reasoning skills needed for operating in places like people's homes. RIKEN says that with these skills, RI-MAN can be put to work in nursing and rehabilitation, in furniture moving, or in any other job that requires muscle. The ability to carry humans! That's the first ability that came to mind when thinking about what robots should do. It's cool though...RI-MAN is cool! Nice site, I'll link to you. Keep it up!